Knutson plays with the Susan Comstock Swingtet on Saturday, Feb 13, at French Garden, 8050 Bodega Ave., Sebastopol. 7pm. Free. For more info on his guitars, visit knutsonluthiery.com. LUTHIER EXTRAORDINAIRE 'This is the most exciting time in music that I've seen since the late '60s,' says John Knutson. 'Let me show you a couple of instruments to pique your interest," says John Knutson, reaching for the cases at his feet, "so you can get a feel for what I do." 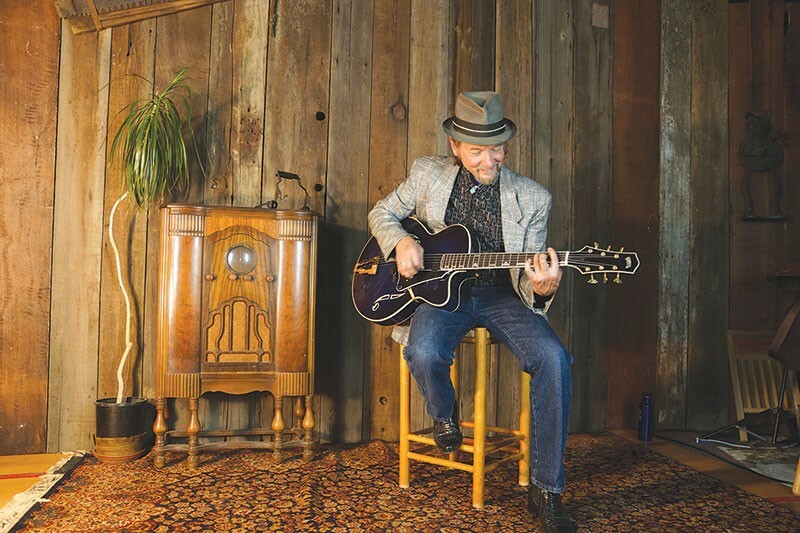 Seated in the corner of a noisy Santa Rosa cafe, Knutson pulls out his go-to instrument, a 1940s-style archtop electric/acoustic guitar he calls Nightlife with a smooth black finish. Next, he unveils a Songbird archtop acoustic mandolin that's shaped like a small jazz guitar, complete with cutaways in the body, and strums a few notes. Knutson not only plays these instruments as a member of the Susan Comtock Swingtet and his own band, Shake the Blues, he built both by hand from his shop in Forestville. The owner and sole employee at Knutson Luthiery since 1981, the 67-year-old has designed and built over 370 such instruments over the course of his career. "My whole interest in building was music-based," Knutson says. He grew up listening to Elvis on the radio and watching Duke Ellington on TV. His first guitar was a Sears acoustic steel string, and Knutson immediately began tinkering with it. After a wood technology class at San Francisco State, he says he's been eating, drinking and dreaming guitars ever since. "I've always designed and built my own instruments from day one," he says. Knutson's designs eventually caught the eye of musicians like bluegrass mandolin legend David Grisman, and ever since, his business has been built solely on word-of-mouth. Today, Knutson's list of clients includes David Lindley, David Miller, (Asleep at the Wheel), Jimmy Fulbright (Oak Ridge Boys) and Chris Wyse (Mick Jagger, Ozzy Osbourne). His most popular design is the Messenger upright bass, a compact standup that sounds natural either acoustic or electric, and is small enough for traveling musicians to take on a plane. Knutson is seeing a resurgence in the mandolin, spurred by a new brand of Americana. "To me, this is the most exciting time in music that I've seen since the late '60s," says Knutson. "What's happening now, what I call porch punk—it's very exciting because it's vital. It has a lot of energy and truth and politics. And like the '60s, it's being followed by a wave of progressive political energy in a time when it's greatly needed. In 10 years, nobody will recognize the world we're in. And that inspires me." Last year, Knutson assembled his bevy of instruments and recruited Grisman and bassist Bill Fouty to record his debut solo album, Shake the Blues, a collection of 13 original songs, written over Knutson's lifetime, that highlight his musicianship and finely crafted instruments. Though Knutson admits his production pace is slowing, he's got no plans to retire from his craft. "I'll probably die with a chisel in my hand and a smile on my face."